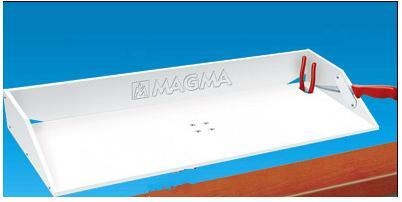 Boatersland Marine > Outdoor Products > Grills/Stoves > Grill Accessories > Magma T10303 Bait/Filet Mate Serving/Cutting Table 13" x 31"
Magma T10303 Bait/Filet Mate Serving/Cutting Table 13" x 31"
Magma Bait/Filet Mate Serving/Cutting Table 13" x 31"
Bait/Filet Mate cutting and serving tables may be used for food or cocktail service, for bait preparation, or for cleaning the catch of the day. They feature 2 filet knife holders and a handy receptacle for your fishing pliers. The slot at the back of the tables permits water drainage from the work surface when you clean or filet your favorite seafood. The Bait/Filet Mate is virtually indestructible and more practical and sanitary than wooden cutting boards. They do not absorb fish odor, will not crack or mildew and are maintenance free. They are made of the finest commercial cutting board material available, FDA approved and UV stabilized high-density polyethylene. All edges and corners are rounded for your safety. Your Bait/Filet Mate will keep your deck free from messy scales and residue. Our T10-302 Bait/Filet Mate is especially useful on small open craft where storage is limited. Our larger T10-303 table is big enough for any bait work and excellent for filleting the big ones that didn’t get away.